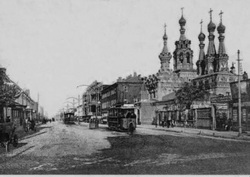 The Moscow where Stephen Graham arrived in 1908 was an odd mixture of old and new (the picture to the left is of Malaia Dmitrikova street which was very much part of the 'old'). Stephen lived very cheaply with friends, eating black bread, and using any spare money to go to the theatre. He wrote occasional article for the English press, but most of his time was spent teaching English, either as a private tutor or in schools. He also loved to go skating in the various Moscow parks. Stephen had always been religious, but his outlook on life was transformed when he visited the cathedral at Sergiev Posad, about fifty miles from Moscow. He was transfixed by the sound of the choir and music (he later wrote it was 'a moment in personal history'). Stephen had fallen in love with Russian Orthodoxy. In his first book A Vagabond in the Caucasus (1911) he wrote how, on Easter Eve, Moscow became the ‘city of the old time’ and a ‘strange mystery and sacredness which must have enwrapped it in ancient days is felt again in the streets. The shops are all shut and dark, the churches are all open and bright ... Even the air is infected with church odours and the multitudinous domes of purple and gold rest above the houses in enigmatical solemnity – they might be tents and pavilions of spirits from another world’. Stephen adored what he called 'Holy Russia'. But his views on the nature of Christianity were far from conventional. At some point during this period he wrote a manuscript called Ygdrasil - a title taken from the name of the great Ash Tree that in Norse mythology connects heaven and hell - in which he wrote how the whole material world represented a series of signs to something more real and profound. Graham believed in Christ as a symbol of love - but there was something very un-Christian about his views of the world 'beyond'. True religion was for Graham not a matter of doctrine but of experience and emotion. God could be found as much in the wild as in a Church. Art and religion could help show the way to God - but God himself could not be contained either within physical buildings or doctrinal forumulations. Please click below for a brief audio commentary on Stephen's first year in Russia.